On our last day, Mike Schwartz and set off upriver with Neto. Mike and I have fished all over the world together. 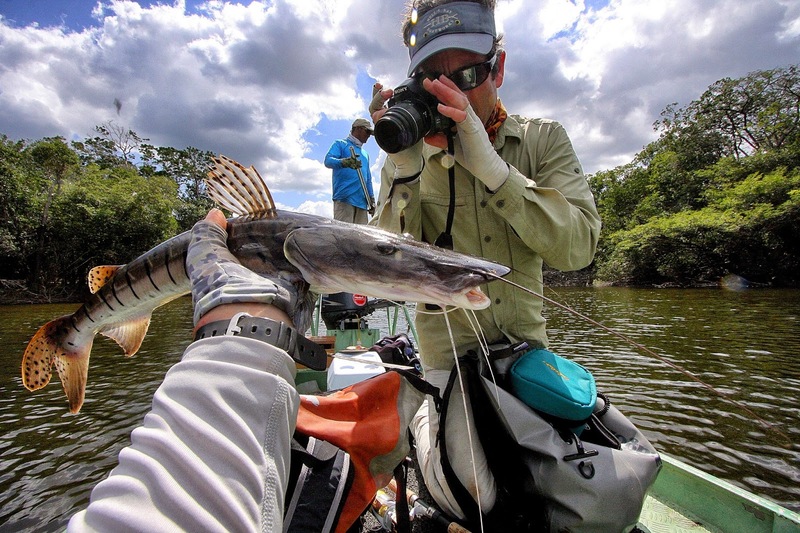 We've fished in the Seychelles, French Polynesia, Mexico, the Bahamas and now we were headed out once again into the Amazon Basin. Mike and I always have good luck fishing together and today would be no exception. After a great morning in a calm lagoon, we snipped off our threadbare flies, tied on fresh offerings and headed further upstream. 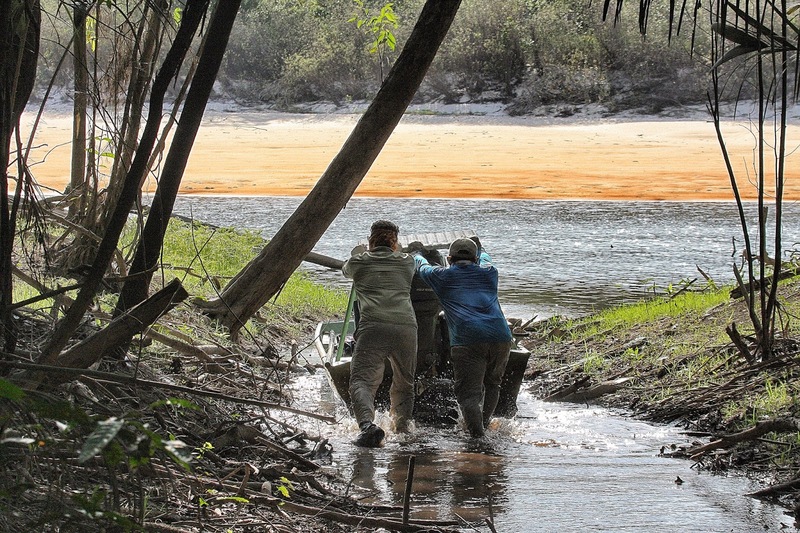 Eventually we reached a hole in the canopy where a small creek was entering the main Agua Boa. While Neto and Mike pushed the skiff in impossibly shallow water, I took photos, offered advice and pointed out wasps nests. As butterfly peacocks, wolf fish and jacunda scattered ahead of us in 6 inches of water, we made slow progress. Eventually we made to a lagoon. It didn't take long for us to find out there were peacocks everywhere. We hooked many big peacocks over the next few hours. 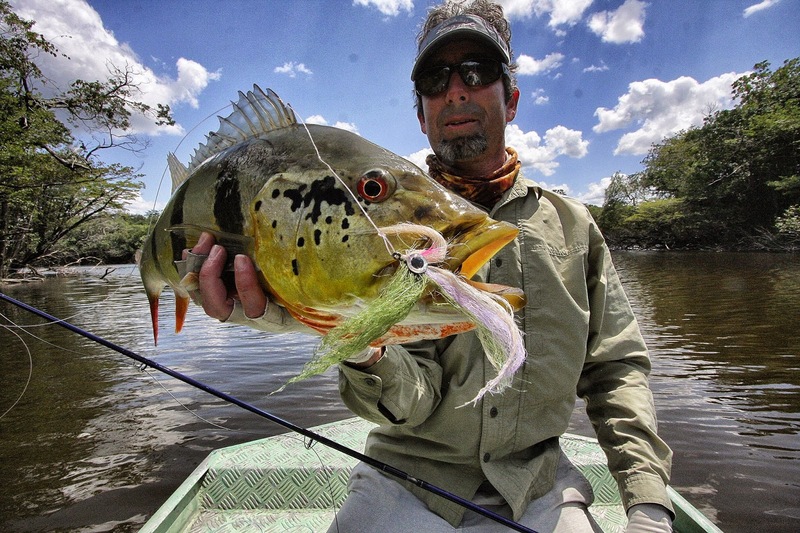 Mike was casting great and plucked a few big tucanare in very shallow water. It was a pleasure for me to watch Mike cast. I've watched him progress every year and this year he has reached a new level of expertise. How good was our fishing for peacocks? Well after lunch, we abandoned our pursuit of the many peacocks in the lagoon and decided to try to hook a surabim catfish. These beautiful catfish were abundant, but very hard to stay buttoned up to. We could get a hook in them, but they mysteriously seemed to be able to throw the hook every time. Finally, Mike got tight to one and we were able to see a surabim up close and personal. Finally, we ran out of time knowing we had to yet make our way back through the creek. When we reached the mouth, Neto told us to keep our eye out for sting rays and for good reason... the stingray's tail contains a sharp spine. Almost immediately upon entering the creek, we saw a stingray half buried in the shallow mud. As soon as we alerted Neto, he marched to the front of the boat and using his machete, cleaved the basketball-sized ray in two. I asked Neto to cut off the tail. I carefully put the still wriggling tail in a plastic bag and put it in the cooler. I brought the stinky mess home with me. I was curious what the barb looked like. When I got home last weekend, I put the stinky bag in my freezer. Yesterday, I dissected the tail, carefully removing the barb and cleaning off the venomous slime. Below is a photo of the barb. It is about 3.5 inches long and razor sharp. 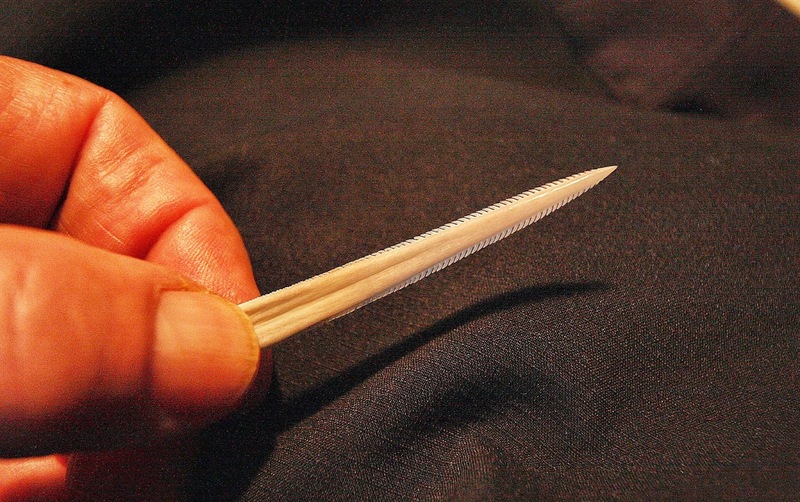 You can see the serrated edges would make the barb very hard to pull out. When we reached the main river, Mike and I cracked our last beer while Neto cooled off in the river. soon we were headed downriver. The trip was over, but what a great way to end a great week! Mike Kotrick with a big peacock! Gude Bacaba with a BIG peacock! On our second day, I fished with my old friend Doug Jeffries, Bacaba and an ever-changing, but constant parade of exotic birds. Our morning included a couple of very large peacocks and a snagged Amazonian sting ray. These beautiful rays have a huge barb for their size in their tail. This toxic barb can be driven deep into the flesh and cause intense pain. Bacaba kept this ray at arm's length! After Bacaba carefully released the ray, I was probing the shore when a big "spotty" (spotted or paca peacock) ambushed my fly just off a maze of branches near the end of a long lagoon. To keep him from returning to the tangle of branches, I clamped down hard with my line hand, but not hard enough. The pain was immediate as the line sawed through my sunglove including the leather patch on one of my fingers. Yes, I was left with a nasty line burn, but also an "about-as-big-as-they-get" spotted peacock of almost 11 lbs. "A fair trade", I thought. A big caiman watched and seemed to agree. Amazon 2015: Photos from the Fish Market in Manaus and Day 1 on the River. Some of us came in a day early and decompressed with a relaxing day in Manaus. We visited the fish market and the opera house then enjoyed a great dinner before it was off to the river in the morning. We were fishing by 10:00 AM which added almost a full day to our week! All these peacocks shown below came from our "bonus" day. I had 6 fish over 10 lbs. on this first day with one tipping the scales at 16 lbs.! My trip was made before it even started! piraucu (arapaimaya). A hint of things to come. Loading up to get back on the river.